The verb in French for crush, run over (car) is the Regular er verb écraser. To remember this imagine: 'E CRAZY man is crushed / run over by a car! Improve your French vocabulary learning using picture memory triggers this will give you great recall of new French words and concepts! Learn other verbs with similar conjugations such as calculer, déboucher, dérober, éclater, faucher and many others. ... there's more information below the verb table on this word. Imagine 'E CRAZY man is crushed / run over by a car! crush! écrase ! écrasons ! écrasez ! 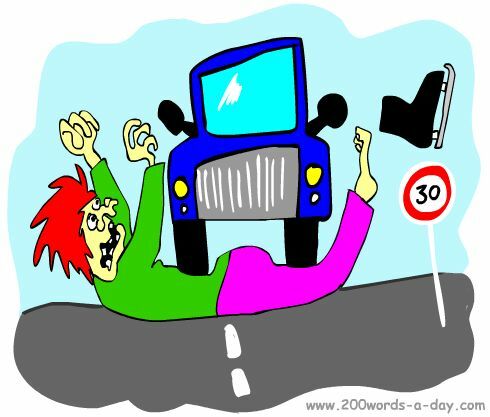 s'écraser: to (have a) crash, to splatter. se faire écraser: to get run over. l'écrasement (m): squashing, crushing, running over. écrasant (adj): crushing, overwhelming, enormous, sweltering. The French verb for crush écraser is a Regular ER verb conjugated using the same pattern of endings as 5,000+ other Regular ER verbs. Learn to conjugate écraser and it will reinforce the pattern for ALL Regular ER verbs, these being the most common French verbs. Do a series of ER verbs every day for a month and you will have a solid knowledge of the ER verbs' conjugation patterns. Keep doing them with a new one every day from the French Verbs List. Repeating these tables aloud 10 times throughout the day will better embed the patterns into your subconscious, and your long term memory. Reciting aloud is a great way for you to practice your pronunciation, and helps you to memorize the conjugations. ✔ YOU can easily add similar daily French verb lessons to YOUR website - free by copying and pasting some code we give you. ✔ You can more easily remember words and verbs like the French for crush écraser using the techniques of the world's Memory Masters. 200 Words a Day! Free Daily French Lesson Online - the verb in French for crush écraser - fully conjugated. French Learning Made Fun and Fast with your free newsletter Verb Lesson - écraser - the French for crush.